Picture this. It is a beautiful Saturday morning, your roommate is playing the War chant, there is not a cloud in the sky and the Noles kickoff at 8:00 pm. Tailgate season is upon us and I’m here to bring you up to date with the latest fashion attire trends. Although it looks like you’re in a Bring It On sequel, cheerleading skirts are one of the popular bottoms that girls pair with a custom college tube top. Did I mention that they’re affordable too? I have also purchased an FSU bralette top on Etsy from a store called Cougar Cutz. Hype and Vice offers all the necessities you need (in every style and color there is). If you’re not feeling a skirt and want to go more with an edgy look—you can rock a pair of distressed overalls or plain jean shorts. Girls also like to wear a bralette with their outfits. I’ve had a lot of luck finding cute gameday dresses or tops in garnet or gold at Francesca’s too. When it comes to tops, the options are endless. Any bottom goes with a crop top, halter top, bandeau, or DIY shirt. Personally, I have never been skilled in cutting or distressing t-shirts so I have either bought them from Etsy or have had my roommate style it for me. There are also YouTube tutorials and resources online if you are into doing it yourself. Many of the girls will wear college chokers. Etsy has some fun customized ones including this one too. 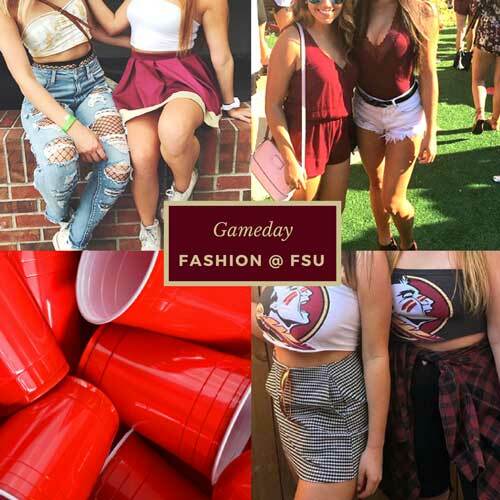 Locally, the girls will get their FSU outfit from Henrigirl, Ooh la la boutique, Olde Fields Clothing Co, Barefoot Campus Outfitter, and Urban Outfitters. 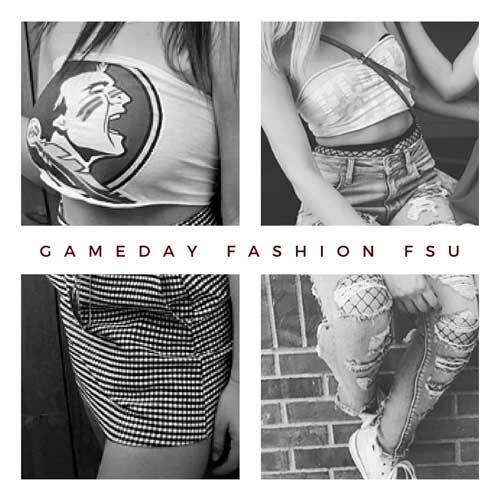 You may also want to grab a pair of FSU kicks in either high tops or low tops, Converse or Adidas to complete your GameDay outfit. If sneakers are not your style, pick out some trendy sandals. For the guys, they mostly wear polos or dry fit collared shirts. These can come from Johnnie-O, Vineyard Vines; even Macy’s has a logo’d button-down shirts. For polos, t-shirts, sweatshirts, sweatpants – really just about anything that screams their college logo, check Fansedge, Fanatics, and Life Is Good. Have U Heard that the collegiate stadiums have a Clear Bag Policy for football games? When game-day gets here, you need to make sure you have everything you need. This one-of-a-kind Clear Game Day crossbody purse is the perfect choice to carry all of your essentials in a way that also highlights your intense fervor. Use HUH15 and then you will receive 15% off and look like the most devoted FSU Seminole fan when you’re carrying this. Out of all the possible combinations I have given, there is one thing I know for sure…it is that you can’t go wrong with…… Garnet and Gold. I mean we have one of the prettiest school color combinations, so you might as well flaunt it. It could be worse, you could be wearing blue and orange. No one cares in college about whether you repeat an outfit or if you had a wardrobe malfunction. This is a time for you to express yourselves in whatever way you please and find the outfits that you feel most confident in. Confidence is key. If you like what you put on and are looking good, it changes how you carry yourself and also the way you interact with others. Sure, I gave you a lot of trendy and cute suggestions for every tailgate and college game day of the season, but it is important to pick something that you’re comfortable in. Remember we may lose a game, but you have never lost a tailgate. Go Noles!